iWebAlbum - Free Web Photo Album Generator. 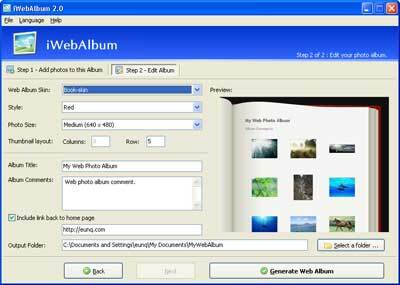 iWebAlbum 2.02 - Free Web Photo Album Generator. iWebAlbum is a free program which allows you to create great-looking web photo album ( sample 1 , sample 2 , sample 3 ) with just a couple of clicks. iWebAlbum runs on Windows 98 / ME / NT / 2000 / XP / 2003 / Vista, each 32-bit and 64-bit. What a great program. Very easy to use, in less than 5 minutes I installed it and created a web album. It's free, and perfect. I usually do my own coding by hand, but recently I have had some fairly large photo albums to make. So I tried out some gallery creating software. Most of it turned out to be either as much work to configure as to do without, and/or had to use a lot of tables and threw font tags around like F----P---. Then I ran across iWebAlbum! My first experiment used 100 images. It was done in a few minutes, and when I looked at the new pages with both browser and text editor I almost wept for joy. This program was exactly what I needed for making a gallery on the spur of the moment. Not only is iWebAlbum ideal for someone who has no knowledge of HTML (and all that other three or four letter stuff), but one who understands web code can use it to great benefit. The finished pages are easy to edit because the code is lean and valid. It's a snap to make new templates, although the present version (1.50) won't recognize them unless they are given the names of the ones that come with it. Not a big problem, you can have any number of custom templates on hand by juggling folder names in your file manager. Besides all that, it is small, fast, efficient, stable, and doesn't dump a load in the registry or anywhere else. Thank you for making such a great program iWebAlbum. It's so cool! The icons there are so cute as well as the themes for the albums. You can save language_xx.xml file to your "iWebAlbum_Folder\language\"